NEW YORK, May 24, 2015 -- Legacy Recordings, the catalog division of Sony Music Entertainment, is proud to announce the release of The Isley Brothers: The RCA Victor and T-Neck Album Masters (1959-1983), a monumental 23-disc box set, on Friday, August 21, 2015. An essential library collection chronicling the sonic evolution and abiding achievements of the unprecedented R&B ensemble, The Isley Brothers: The RCA Victor and T-Neck Album Masters (1959-1983) follows The Isley Brothers through their transformation from a 1950's doo-wop/gospel vocal group into the world's preeminent R&B rock 'n' soul powerhouse party band. As evidenced in this quarter century of recordings, The Isley Brothers absorbed the music and culture surrounding them to continually create contemporary sounds spanning the decades. The Isley Brothers: The RCA Victor and T-Neck Album Masters (1959-1983) features newly remastered versions of The Isley Brothers' 21 albums released for both labels, nearly all of which are expanded with rare mixes and tracks making their CD and digital debuts. The new collection includes 84 rare and previously unreleased bonus tracks. This set also includes, released here for the first time in its entirety, the "Great Lost Isley Brothers Album": Wild In Woodstock: The Isley Brothers Live At Bearsville Sound Studio 1980. First conceived as a "live" double album (with overdubbed crowd noise), this newly restored performance offers an immersive look at a crucial chapter in The Isley Brothers' history, a pivotal moment in the fusion of rock and funk music in an era fueled by the sound of the Isleys. By the 1990s, The Isley Brothers' dominant influence over hip-hop music and culture could be felt at every turn. "Footsteps In The Dark" from 1977's Go For Your Guns was sampled in Ice Cube's "It Was A Good Day," while The Notorious B.I.G. 's "Big Poppa" interpolated the title track of 1983's Between The Sheets. The Isleys' flashy fashion sense directly inspired the "bling" aesthetic embraced by rappers everywhere. R. Kelly proclaimed the group his biggest influence, collaborating with them on his Top 5 hit "Down Low (Nobody Has To Know)" in 1995 (featuring Ronald Isleyin a career-redefining role as Mr. Biggs in the accompanying video). Kelly's writing and production for the group continued through the 1990s and 2000s, peaking with Body Kiss which hit No. 1 the Billboard 200 in 2003, a full 44 years since their first hit with "Shout." 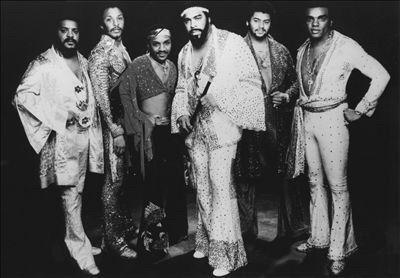 The Isley Brothers' classic works continue to reach new fans through consistent radio airplay, film and television licenses and samples: in 2015, Kendrick Lamar won two Grammy Awards® for the track "I," built upon the groove of "That Lady" (from 1973's 3+3), while singer/rapper Frank Ocean covered "At Your Best (You Are Love)" from Harvest For The World (previously covered by Aaliyah in 1994, who made it a Top 10 hit).